It is the latest generation product in our company which adopting PLC Human Interface, with frequency Converter, high automation, easy operation, novel figure, all-round-functions, advanced technology, stable running, durable life, conforms to "GMP Standard". 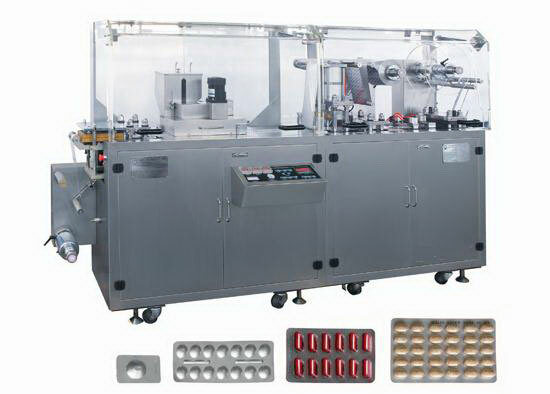 It is an ideal blister packaging machine for AL/PL, AL/AL, Paper/PL packaging. It has passed Province technology production authentication. The heat sealing station is fixed, the distances between forming, perforation and punching etc. Units can be adjusted freely on the same plane and it is suitable for all kinds of dimensions with high precision, strong adaptability. Flat structure, registration heating, mechanic(positive pressure) forming, up and down net web, cylinder heating sealing , manipulator draw, adjustable stroke, lower noise and steady of operation. Main transmission adopts imported gear reducer, with excellent performance, lower noise,long life, stable operation. It can be equipped with optical fiber or photographing checking device according to the customers' requirements.